Look at these guys! Gorgeous. 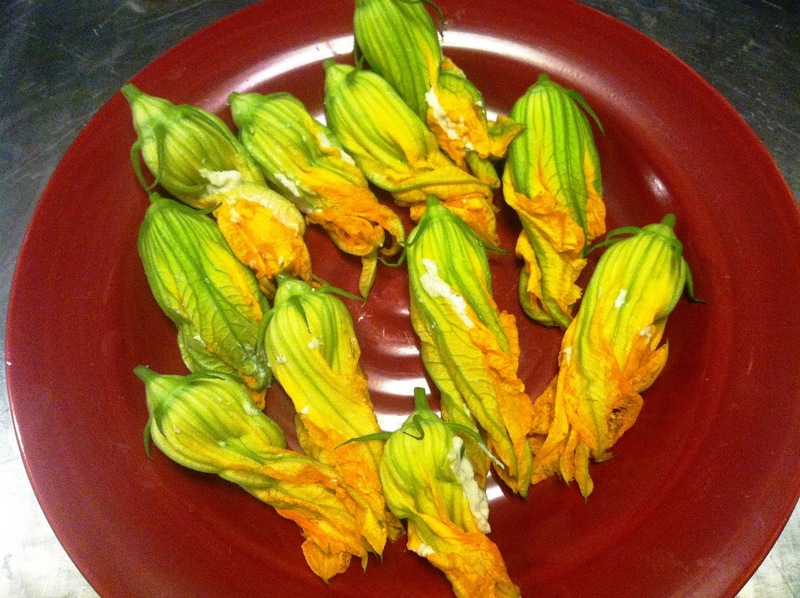 Making squash blossoms has always seemed pretty out of my league – they’re so delicate, and seemingly decadent. But I couldn’t resist. 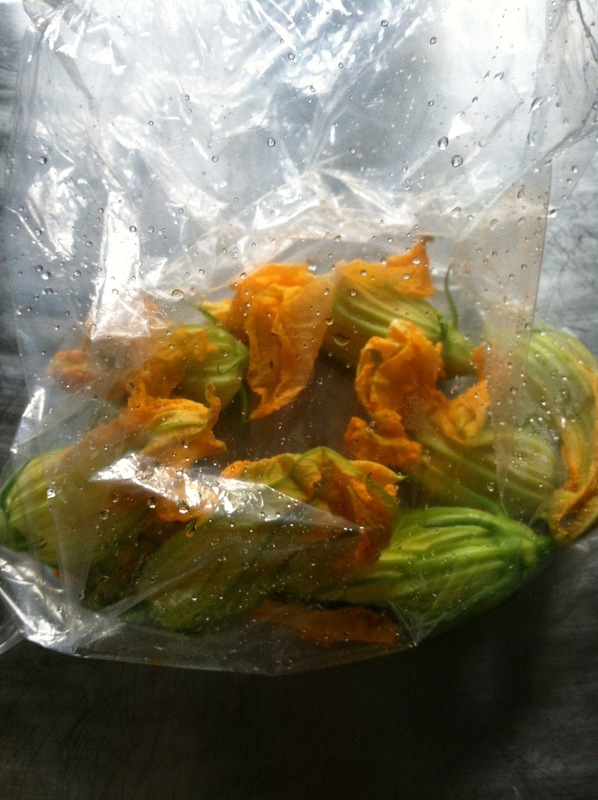 I bought a bag, went home, and googled the trash out of “squash blossom recipes”. 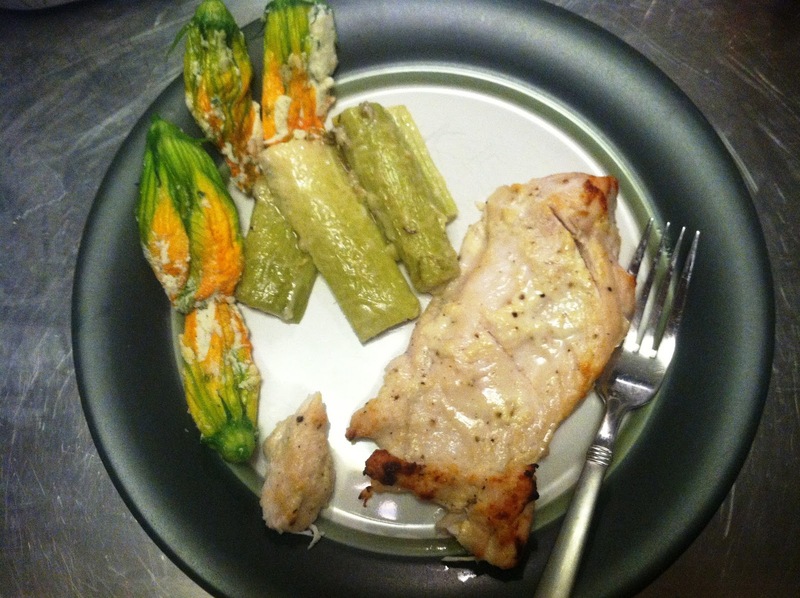 The basic premise seemed simple enough – stuff them with something, then either deep fry, bake, or pan sear them. Since I’d been alerted to the fact that it was Rosh Hashanah, and Brad and I have basically decided on combining our different religious backgrounds to include “traditions”, I thought I’d make him a little pan-seared squash blossom, stuffed with a filling of ricotta, apple, and honey (for a sweet new year). We could have eaten these for dessert instead of a side at dinner. They were savory, so pretty, and honestly, they looked like SO much more of an effort than they actually were to make. So here we go. 1. 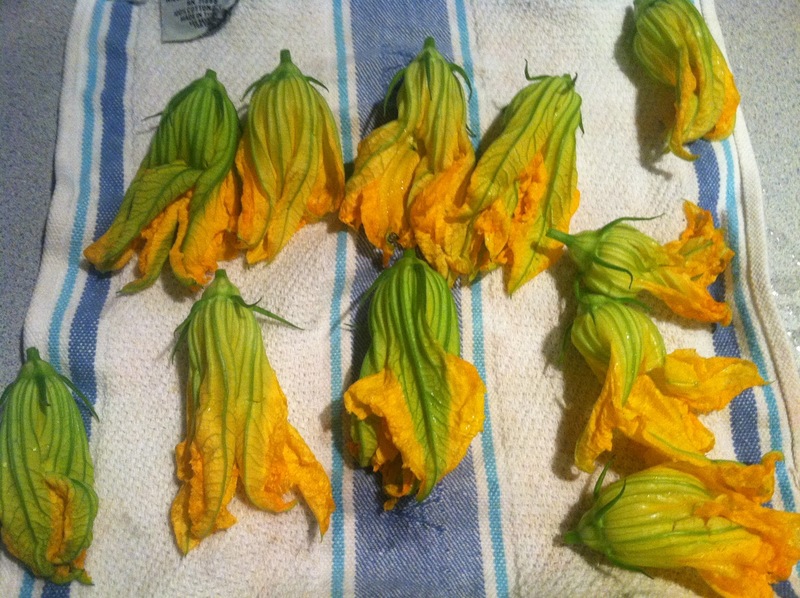 Be unable to walk by squash blossoms without thinking they’re so pretty, and then mentally talk yourself into the fact that you can cook with them. 2. Wash out the blossoms – gently. You can kind of ply them apart with the larger end of a chopstick. Just make sure any bugs, etc. are out of the blossom. 3. Gently snip out the center of the blossom, being careful not to make a hole in the bottom of the blossom, or tear the leaves. that center part, the polleny-looking thing, has gots to go. 4. Combine the ricotta, honey, salt, nutmeg, and microplaned apple, stir to combine. Add mixture to a plastic bag, snip a small corner off the bag. This is now your pastry bag, so you can insert the filling into the blossom more easily. 5. In a large saute pan, add a 1/4 inch of olive oil. Heat over medium high heat until hot. 6. 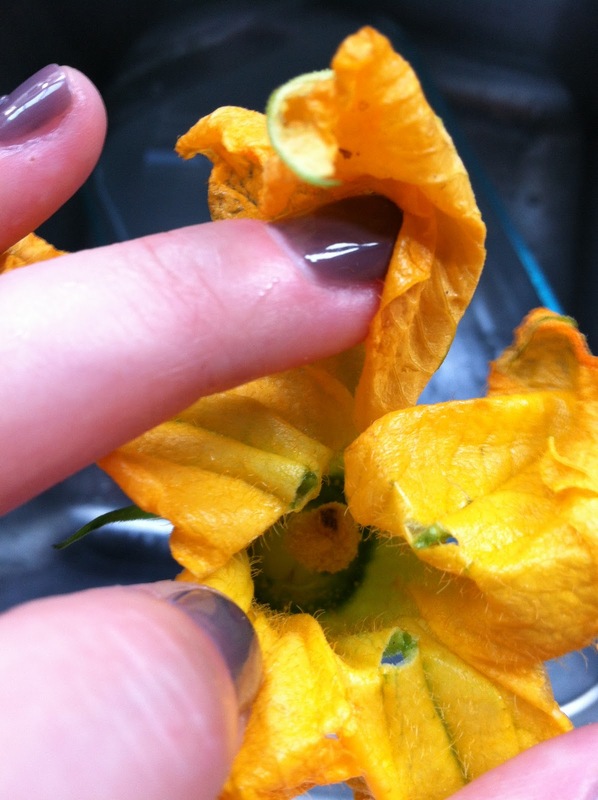 Insert the filling into the squash blossoms. Twist the petals together so that the filling is securely enclosed. 7. Carefully add the squash blossoms to the pan, searing lightly (approx. 2 minutes). With a pair of tongs, flip the blossoms over so that all sides are cooked evenly. Some filling will fall out, but just keep turning them. 8. Serve alongside dinner (ours was Greek Yogurt Chicken and baked leeks). Have your non-practicing, but still tradition-sentimental, Jewish fiance think you’re the most thoughtful thing ever because you remembered his New Year. This entry was posted in apples, farmers market, honey, ricotta, Rosh Hashanah, seared, sides, squash blossoms on September 20, 2012 by westyn.